Note: This guest blog on exercises was written by Luke Kriley, student physical therapist on clinical rotation with us from Wichita State University. We believe it’s important for students to be able to share our knowledge with the community at large in practical, easy to understand ways. The goal is that we will be the practitioner of choice for musculoskeletal conditions. Nice work Luke! Our bodies were engineered to move, as bipedal beings we were given a bony skeleton layered with muscles, tendons, ligaments, and nerves all capable of manipulating our skeletal to generate physical movement. Yet our society has become adapted to living “off our feet” and tolerating sedentary lifestyles, which has led to an outburst of (lack of movement) exercise/nutrition dependent diagnoses such as type II diabetes mellitus and obesity. Locomotion:Repetitive striding; running, jogging, and walking based on single leg movements consisting of a stance and propulsion phase to transmit force into ground which eventually transports body from one place to another. Level Changes: Squats and lunges, parallel and staggered stances, and their variations to change the level of the body in relation to the horizontal plane. (Squatting under a rope, ducking under a punch, or jumping over an obstacle). Carrying:Carrying heavy objects resulting in co-contraction and stabilization of core to allow us to carry/relocate/manipulate objects. (Carrying groceries, suitcases, or a bucket of grain). Our bodies need to move, they desire it. Take for example a long car ride in which you have been seated stooped over the steering for hours without a stop. What is the first thing you want to do once arriving at your final destination? Go find a lavish chair somewhere and sit a few hours longer? Heck No! You crave to get out and walk, stretch, twist, push, pull, and just move in general! It feels good to move and those who have been inactive/sedentary for extended periods of time who begin moving again, may have the greatest understanding of this “feeling” as they start to experience the physical and mental benefits associated with physical activity and movement in general. Below are just a few benefits associated with regular physical activity. Patients with chronic pain experience a 25% pain reduction after 25 minutes of aerobic activity (1). So, if you are currently inactive and want to GET MOVING, here are a few recommended exercises that require little to no equipment and will assist you in building a strong foundation for future exercise and activity. The following exercises incorporate a variety of movement strategies and can help develop basic motor skills, core strength, coordination, and balance for proper movement with activities of daily living and recreational activities. Go for a walk – The American College of Sports Medicine recommends adults engage in 30 minutes of moderate exercise (walking at 3-3.5 mph) 5 days a week to reduce risks of future comorbidities. This can be done in bouts of 10 minutes to reach the 30 minute goal. Single Leg Balance – Keep a 10-20 degree bend in knee and try to displace your COG (center of gravity) by reaching or leaning forward, backwards, and side to side while maintaining balance on one leg for 15-30s. Clamshell – A simple exercise that can be done anywhere which provides excellent strengthening to proximal hip muscles important for proper walking, running, and squatting mechanics. 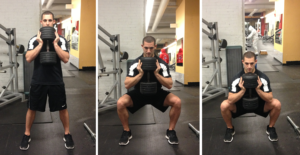 Goblet Squat – Squatting is a foundational movement and serves as a precursor to many other movements we do every day. 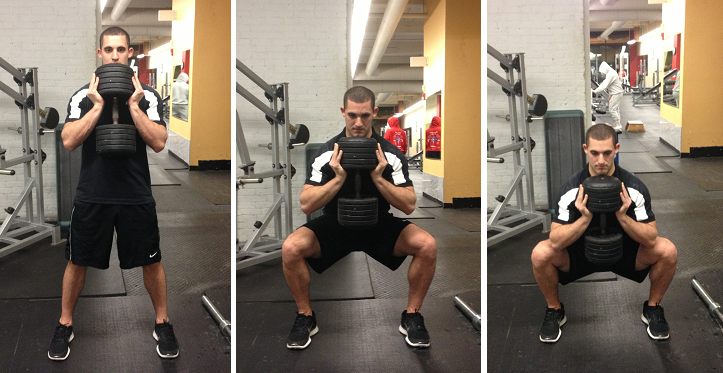 This exercise will assist in developing your squatting abilities and hip mobility. 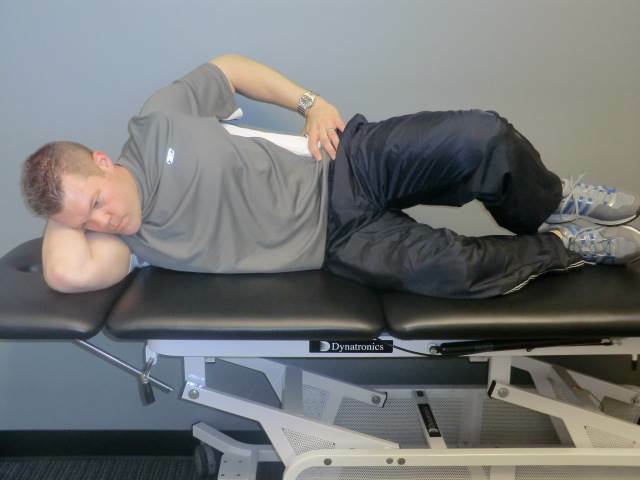 RDL – Another simple exercise which will develop posterior chain strength (gluteals, hamstrings, back erectors) as well as assisting with developing proper hip hinging essential for safe and efficient bending to help decrease future back injury. This exercise can be done with dumbbells or a barbell, two-legged or one-legged. Dead Bugs – A good core stabilization exercise that can easily be progressed as you become more efficient and capable of sustaining a strong core contraction with a neutral spine. 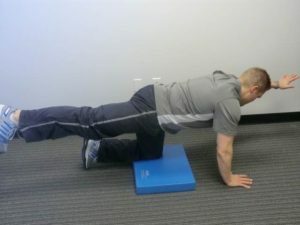 Bird Dogs – Another great core stabilization exercise that will improve your coordination and ability to stabilize your spine during dynamic movement. Lunges – Start with forward lunges and progress to lateral lunges and finally a forward lunge with trunk rotation. 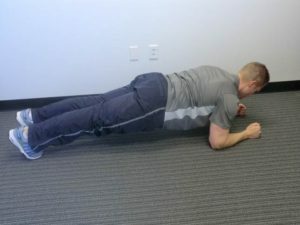 Planks – An exercise that incorporates co-contraction and development of core strength and endurance. Start with planks from a counter-top, next to a bed, to the floor from your knees, and finally a full plank on floor. Push-ups – Push-ups are a great upper body exercise to develop general strength when done correctly. They’re numerous variations of the standard military push-up. Start out by doing push-ups against a door, then off a counter-top, then off your knees on flat ground, and finally to a full push-up. Remember, the recommended amount of daily physical activity set forth by the American College of Sports Medicine is 150 minutes per week or 30 minutes a day 5 days per week. It is always a good idea to check in with your Doctor before initiating an exercise program if any cardiovascular or musculoskeletal risk factors exist, and if you’re cleared, these exercises are a great start. Hoffman MD, Shepanski MA, Mackenzie SP, Clifford PS. Experimentally induced pain perception is acutely reduced by aerobic exercise in people with chronic low back pain. J Rehabil Res Dev. Mar-Apr 2005;42(2):183-190. Janal MN, Colt EW, Clark WC, Glusman M. Pain sensitivity, mood and plasma endocrine levels in man following long-distance running: effects of naloxone. Pain. May 1984;19(1):13-25. Oh H, Taylor AH. Brisk walking reduces ad libitum snacking in regular chocolate eaters during a workplace simulation. Appetite. 2012 Feb;58(1):387-92.